Google has released an epic second edition of their ground breaking The Datacenter as a Computer book. It's called an introduction, but at 156 pages I would love to see what the Advanced version would look like! It's such a far ranging book that it's impossible to characterize simply. 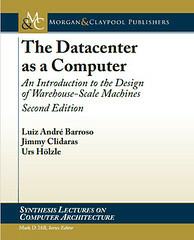 It covers an amazing diversity of topics, from an introduction to warehouse-scale computing; workloads and software infrastructure; hardware; datacenter architecture; energy and power efficiency; cost structures; how to deal with failures and repairs; and it closes with a discussion of key challenges, which include rapidly changing workloads, building responsive large scale systems, energy proportionality of non-CPU components, overcoming the end of Dennard scaling, and Amdahl's cruel law. In reading it I get the sense the Faerie Queen has transported us to the land of Faerie, a special other place of timeless truths, where dragons roam, and mortal danger lurks. And if you do escape, nothing is quite the same ever again. After nearly four years of substantial academic and industrial developments in warehouse-scale computing, we are delighted to present our first major update to this lecture. The increased popularity of public clouds has made WSC software techniques relevant to a larger pool of programmers since our first edition. Therefore, we expanded Chapter 2 to reflect our better understanding of WSC software systems and the toolbox of software techniques for WSC programming. In Chapter 3, we added to our coverage of the evolving landscape of wimpy vs. brawny server trade-offs, and we now present an overview of WSC interconnects and storage systems that was promised but lacking in the original edition. Thanks largely to the help of our new co-author, Google Distinguished Engineer Jimmy Clidaras, the material on facility mechanical and power distribution design has been updated and greatly extended (see Chapters 4 and 5). Chapters 6 and 7 have also been revamped significantly. We hope this revised edition continues to meet the needs of educators and professionals in this area. Computation is moving into the cloud, and thus into WSCs. Software and hardware architects must be aware of the end-to-end systems to design good solutions. We are no longer designing individual “pizza boxes,” or single-server applications, and we can no longer ignore the physical and economic mechanisms at play in a warehouse full of computers. At one level, WSCs are simple— just a few thousand cheap servers connected via a LAN. In reality, building a cost-efficient mas- sive-scale computing platform that has the necessary reliability and programmability requirements for the next generation of cloud-computing workloads is as difficult and stimulating a challenge as any other in computer systems today. We hope that this book will help computer scientists under- stand this relatively new area, and we trust that, in the years to come, their combined efforts will solve many of the fascinating problems arising from warehouse-scale systems. Is this available as an ePub or other Kindle friendly format? PDFs aren't so great on Kindle.